Not much to report here but it’s such a fine example of the Global New Renaissance unfolding, that I’m allotting it an item of its own. This is a great honour and a valuable addition to the recent cultural achievements attained by Sharjah. Celebrating Sharjah on the MIBF platform reflects the long-term vision and keenness of both the UAE and Russia to establish bridges of communication with other world cultures. We believe culture binds nations and people together, and promotes tolerance and understanding. Russia is treasured worldwide for its important history and strong cultural output. Some of the world’s best poets, authors, historians, musicians, continue to be born here. It is also a country home to thousands of publishing houses. We are excited to establish a special presence at the 32nd MIBF in a few months from now, and look forward to using this opportunity to understanding a vibrant culture a bit better, and also sharing our own. We are proud to host Sharjah, as a special guest of honour at MIBF this year, which is the same year that the world is celebrating the emirate as the Unesco World Book Capital. Sharjah will be our window, not only to Emirati, but Arab culture. The book fair will be a great platform for promoting cultural exchange and co-operation between our two countries. There are half a billion people native Arabic speakers in the world, and we are very interested in the language and the culture that birthed it. Today, Muslims account for 20 per cent of the Russian community, where 50 cultures live underneath the diverse Russian culture. 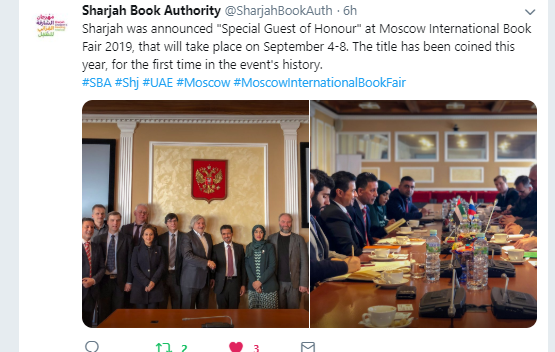 I will add here, before I get inundated with emails asserting this report in not quite accurate, that the English language version of the Moscow International Book Fair website states Sharjah is Guest City and that Belarus is Guest of Honour and my guess is there is some translation ambiguity about the exact wording. It of course makes no difference to the importance of the story, and would appear to confirm Sharjah as the first city to be a guest at the MIBF. Sharjah is of course due to become World Book Capital later this week and there seems little doubt it will be one of the most spectacular openings to any book event anywhere in the world. Next → Next post: New Zealand authors struggle to survive on earnings from their writing, mirroring UK authors’ plight. But is there such a thing as a fair wage for writers?